'Stars Over Chicago' RB ( Henry Danielson, R. 1972). Seedling 72-5. AB, 28" (71 cm), Midseason late bloom. Standards tan, darker rim; Falls same; blue beard. 'Genetic Leader' X 'Genetic Artist'. Mount Clare Iris Gardens, 1973. Honorable Mention 1974; White Award 1978. From AIS Bulletin #208 January 1973 Introducing STARS OVER CHICAGO. Arilbred 24", M, Sdlg. 71-5. Medium tan with darker rim on edge of falls; center of petals to sides of ribs metallic lavenderblue; lavender beard. Well-formed standards; falls very flaring. Strong grower and fast increaser. Very fertile pod parent. Received an EC award and was Best Seedling of the Northern Illinois Iris Show in 1972. Genetic Leader X Genetic Artist. $25.00. Mount Clare Iris Gardens. 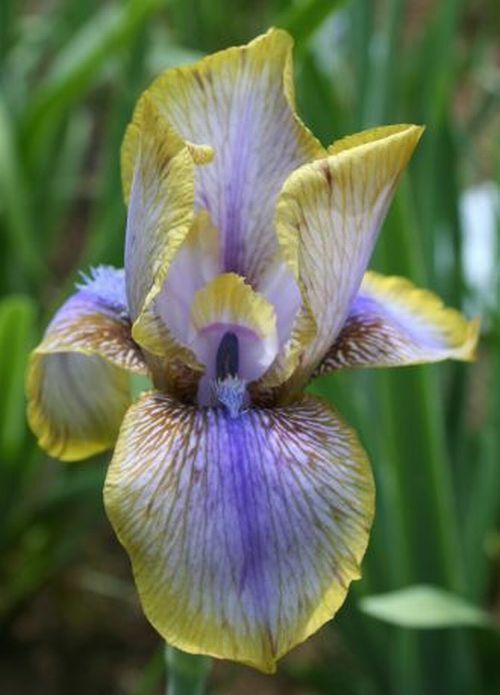 From Pleasure Iris Garden catalog, 1984: STARS OVER CHICAGO--Arilbred, 24", M, Sdlg, 71-5, Medium tan with darker rim on edge of falls; center of petals to sides of ribs metallic lavender-blue, lavender beard. Received most number of votes for HM in 1974, Genetic Leader x Genetic Artist. C.G. White Award 1978. $3.00.